With a support of the joint EU/UNDP Project “Community Based Approach to Local Development” in Kiev took place the meeting-seminar about implementation of local self-government reform conception. The event was initiated by Project’s partner ­– Ukrainian Association of District and Regional Councils together with Ministry of Regional Development, Construction, and Communal Living of Ukraine. Seminar was opened by Hennadii Zubko, Vice-Prime-Minister of Ukraine, Minister of Regional Development, Construction, and Communal Living of Ukraine, Serhii Chernov, President of Ukrainian Association of District and Regional Councils, Governor of Kharkiv oblast, Viacheslav Nehoda, Deputy Minister of Regional Development. The meeting called together representatives of Verkhovna Rada, Secretariat of the Cabinet of Ministers of Ukraine, Central Executive Authorities, Local government, International Technical Assistance projects and leading experts. During the meeting participants discussed strategic planning of local development, attraction of investors and community projects realization. According to experts, efficiency of the reorganization depends on the communities’ activity. The uniting of local communities must be only on their own initiative. Forced administrative units have proved their incapability. For maintenance of local initiatives and proper implementation of local government reorganization Reform Offices will be established in regions. Seminar participants have also offered ways of dealing with current problems, basing on the experiences from their regions. 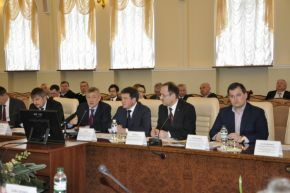 To sum up the results of the meeting, Serhii Chernov, President of Ukrainian Association of District and Regional Councils, Governor of Kharkiv oblast drew attention to importance of proper communication regarding reorganization and importance of established expert groups under the Head of Verkhovna Rada and Ministry of Regional Development, who provide coordination of implementation these reforms.